The Enviro500 is a low-floor, three-axle double-decker transit bus built by Alexander Dennis Limited (ADL), and part of the Enviro series of buses. First produced in 2002, they are hugely successful in the Hong Kong market, with other units operating in Europe, North America and Australia. 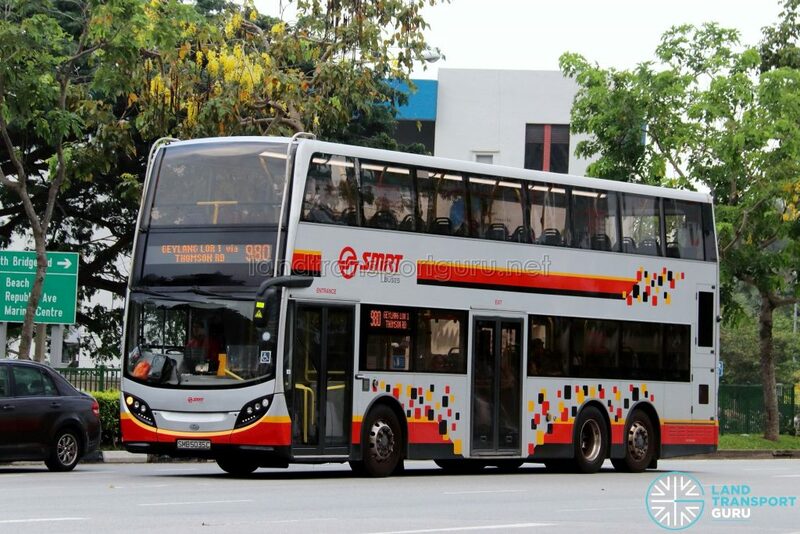 SMRT Buses was initially the sole operator of the Enviro500 in Singapore, with an initial order of 201 Enviro500 MMC buses entering service in 2014-2015. With the gradual implementation of the Bus Contracting Model (BCM), Enviro500 buses owned by the Government were also operated by Tower Transit, who was awarded the Bulim Bus Package. The second batch of 15 buses was ordered with near-identical specifications and subsequently registered under Bus Contracting Model (BCM) on August 2017. These buses come equipped with USB Charging Ports as well. 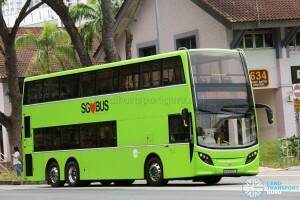 The third-generation Enviro500 model operating in Singapore goes by a few names. These buses can be referred to as E500NG (for New Generation), E500 MMC (for Major Model Change), Trident E500 Turbo or simply E50D. The Enviro500 is part of the Enviro series of Dennis low-floor buses which was launched in 2002. Click here for the full bus model history. 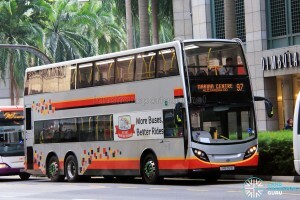 In 2012, Alexander Dennis revealed the third-generation Enviro500 aimed at the Hong Kong market. Named the Enviro500 MMC (for Major Model Change), it boasts a new exterior styling adapted from the Enviro400, along with an all-new interior. The new chassis features improved maintainability, reliability and reduced operating costs. New design features included offsetting the longitudinally-mounted engine and gearbox, along with a safer straight staircase and fuel tank underneath the stairs, a design feature adapted from the Enviro400. 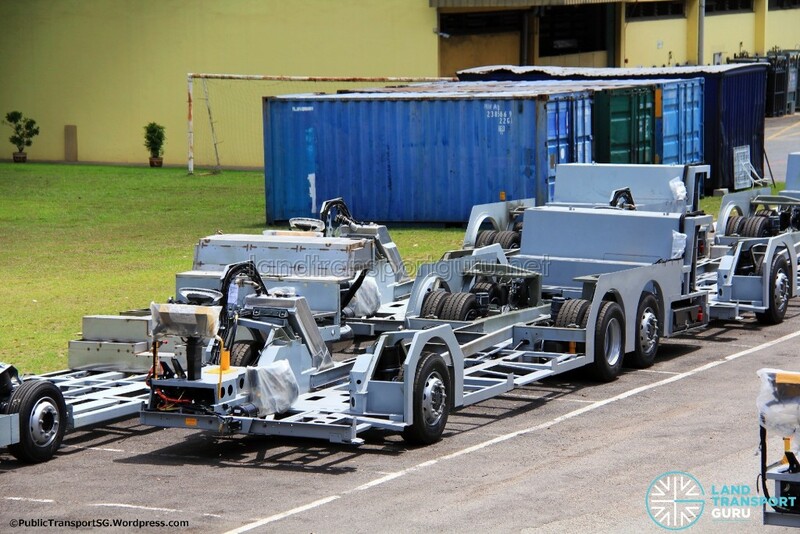 The chassis was was offered in 11.3m, 12.0m and 12.8m lengths. A rear-axle steering system is also made available, supplied by ZF (Servocom® RAS). The Enviro500 MMC is also known as the Enviro500NG (for New Generation), Trident E500 Turbo, or simply E50D (with ‘D’ indicating diesel) or E50H (with ‘H’ for hybrid). The Hybrid variant was made available in 2013, incorporating a series hybrid drive-train by BAE Systems (HybriDrive series-E), achieving the Euro VI emission standard. 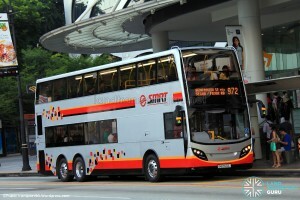 In April 2014, SMRT Buses announced the purchase of 201 units of the 12-metre Alexander Dennis Enviro500 MMC buses, as part of a fleet renewal and expansion initiative. The first prototype bus would be produced by Alexander Dennis in Scotland, and the remaining 200 units would be assembled in Zhuhai, China, and shipped to Singapore completely built up (CBU). The deal is said to be worth around £50 million. 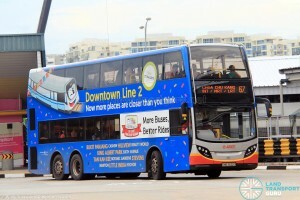 These would be SMRT’s first ever batch of double-decker buses. 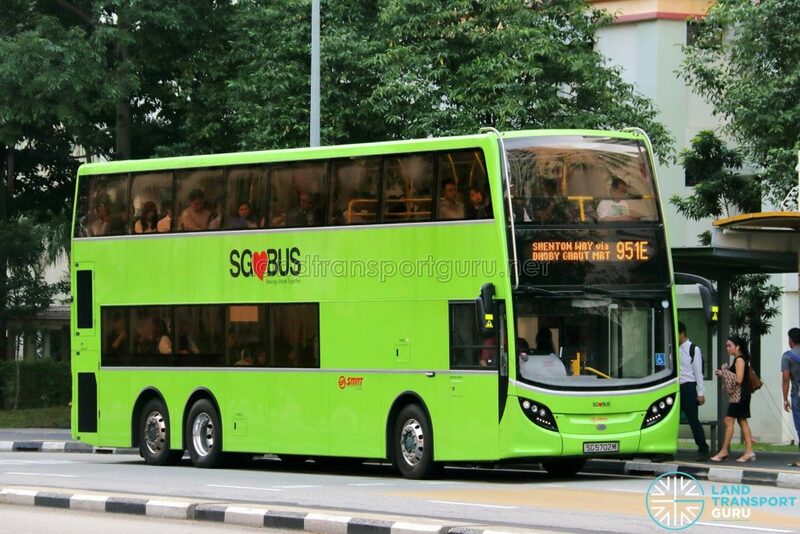 The Alexander Dennis Enviro500s were registered between 19 June 2014 to 1 December 2015, using the registration numbers SMB5001A – SMB5085H for SMRT-owned buses (85 units) and SMB3501L – SMB3616P for Land Transport Authority-owned buses (116 units) (See: BSEP/BCM). 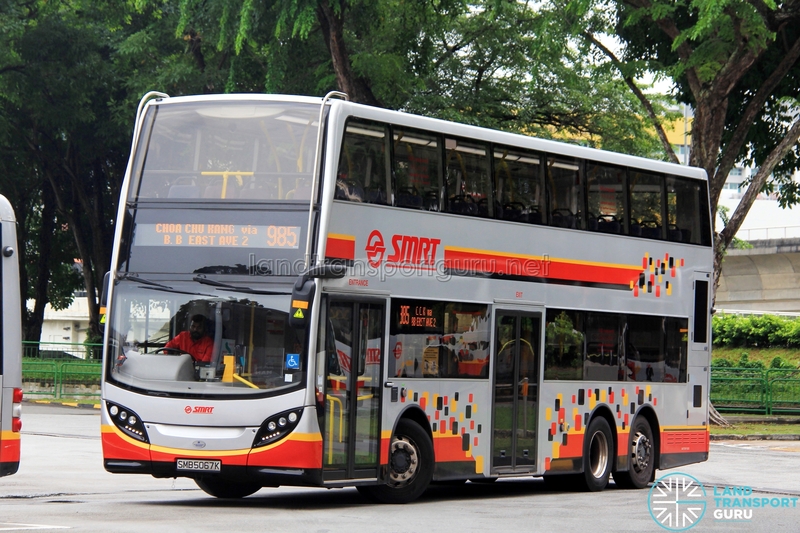 SMRT was also rumoured to have placed options on another batch of Enviro500 MMCs but have decided to forgo these. 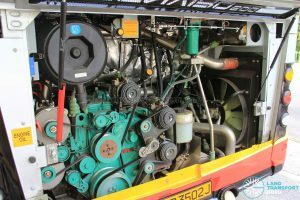 Selective Catalytic Reduction (SCR) technology requiring diesel exhaust fluids such as AdBlue, and achieving the Euro V emission standard. 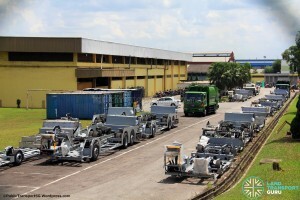 Chassis produced in Pasir Gudang. Assembled in Zhuhai, China, and shipped completely-built-up (CBU) to Singapore. 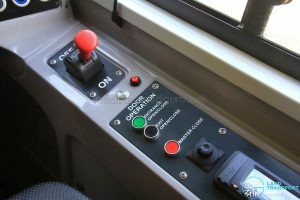 Double-leaf entrance, sliding plug exit. Similar brand first used in SMB138Y. 55 upper deck seating, 28 lower deck seating and 51 standing with one wheelchair bay. 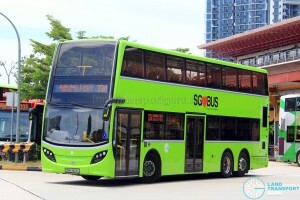 Local Enviro500 buses had their chassis built in Johor Bahru, Malaysia and assembled with the Enviro500 MMC bodywork in Zhuhai, China before being shipped completely-built-up (i.e. as a completed bus) to Singapore. More details in the Bus Production section below. 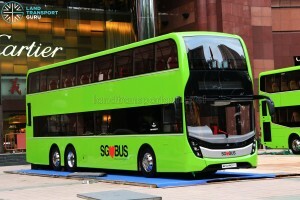 The UK-built prototype bus is SMB5001A, with its chassis produced in Guildford and assembled by Alexander Dennis in Scotland. SMB5002Y, the first SMRT Enviro500 from the Zhuhai bus assembly plant, was built on a UK-manufactured chassis and is a bodywork prototype unit. The 11th digit of the vehicle identification number (VIN) identifies SMB5001A and SMB5002Y as “G” for Guildford, while other production batch units feature “M” for Malaysia. 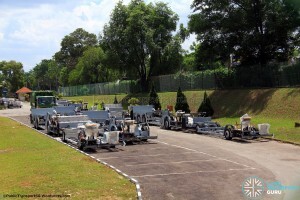 One week before their debut, a preview event was organized for Bukit Panjang grassroots leaders who took a tour around the Bukit Panjang estate and were introduced to the buses’ wheelchair-friendly features and safety mechanisms. 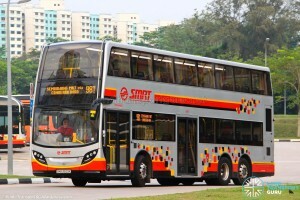 SMRT Alexander Dennis Enviro500 (SMB3502J) – First revenue service trip on Service 972. These buses made their revenue service debut on Sunday, 13 July 2014 on Service 972. Three units, namely SMB3501L (972TQ01), SMB3502J (972AP07) and SMB3503G (972TQ02) were put on service. SMB3502J is the first Enviro500 MMC in revenue service, departing Bukit Panjang Temporary Bus Park at around 7:00 am. 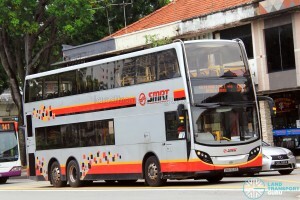 On its second morning trip, SMB3502J was taken out of service at Whitley Road (Aft Tanglin CC) due to a door interlock fault causing the brakes to be engaged; ADL maintenance crew resolved the issue and the bus returned to the depot, and the bus returned to Service 972 in the late afternoon. 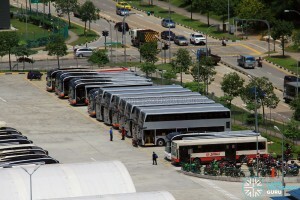 Many more bus services would receive double-deck buses progressively over the subsequent 3 months, such as 106, 188, 190, 700, 850E, 951E, 963, 966 and 969. 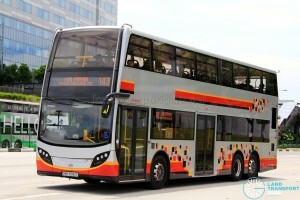 For interior photos, check out Alexander Dennis Enviro500 (Batch 2). As part of the Transitioning of Buses to the Bus Contracting Model, the Land Transport Authority (LTA) would purchase bus assets from both SBS Transit and SMRT Buses and reallocate them to various route packages and their winning operators. 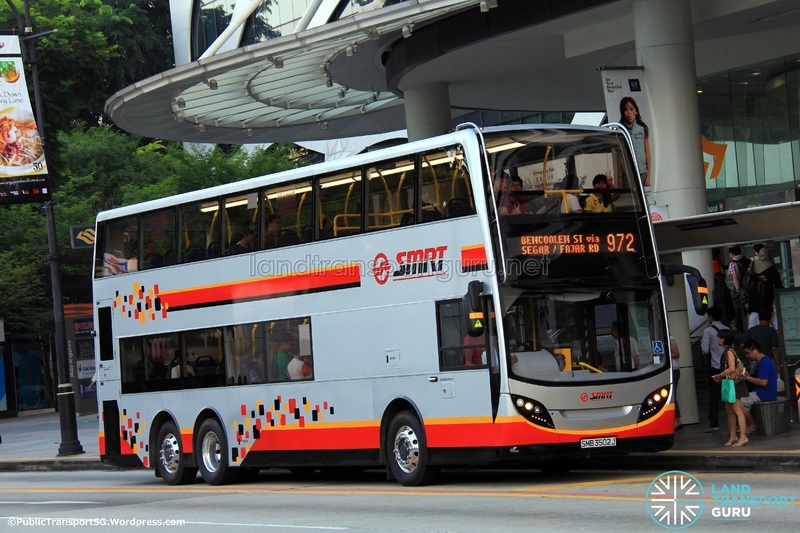 In the early years of the BCM rollout, bus models involved were SBS Transit’s Mercedes-Benz Citaro and Volvo B9TL buses, as well as SMRT’s MAN A22, MAN A95 and Alexander Dennis Enviro500 buses. In December 2016, several uses were transferred to the Bulim Bus Package and operated by Tower Transit, making them the second local operator to operate the ADL Enviro500. 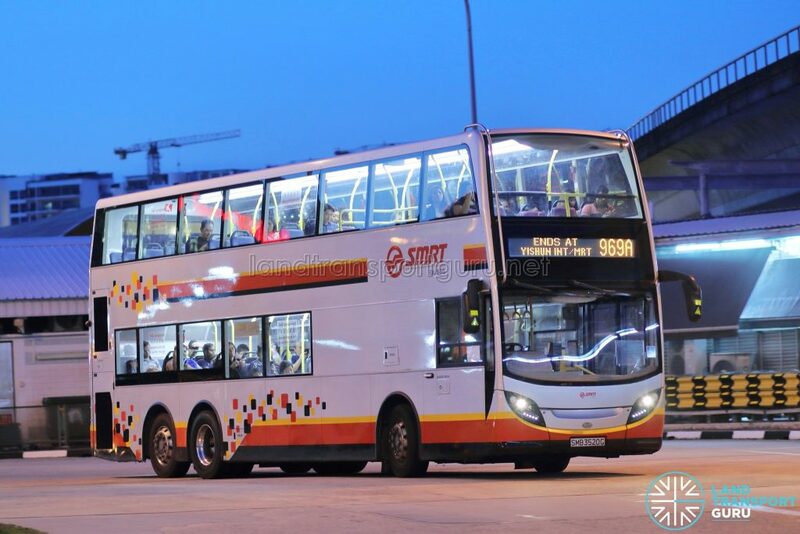 SMRT placed orders for fifteen (15) more ADL Enviro500 MMC buses in late 2016. These buses would subsequently be registered under the Bus Contracting Model (BCM) with the SG-prefix registration plates. 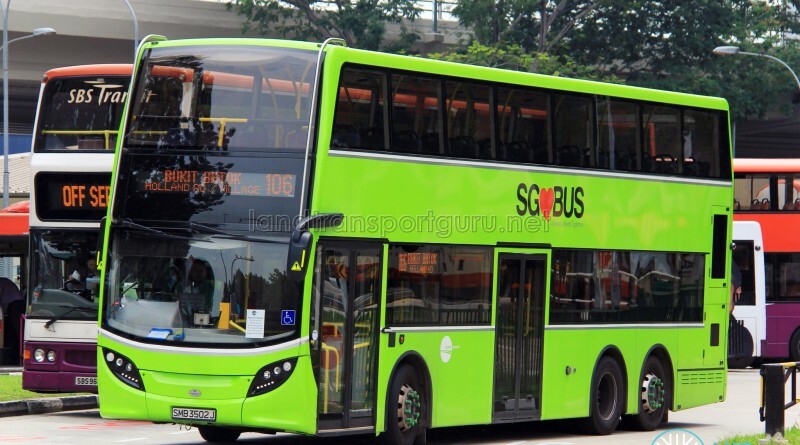 All buses were registered on 10 August 2017 as SG5700T – SG5714D. The second batch of Enviro500 MMC buses feature the same technical specifications as the initial 201 buses delivered in 2014. Although ADL had launched a Facelifted Enviro500 MMC in late 2015, the newer bodywork design was not opted for. 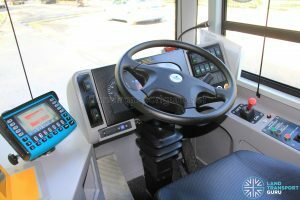 They come equipped with USB Charging Ports, tinted passenger windows, and a pair of emergency hammers next to the upper deck front windscreen, a feature common to Enviro500 buses built for the Hong Kong market. These buses were stored at Kim Soon Lee since April 2017, prior to their registration in July 2017. The first of these buses made their revenue service debut on 14 August 2017, with SG5703K deployed on Bus Service 964. 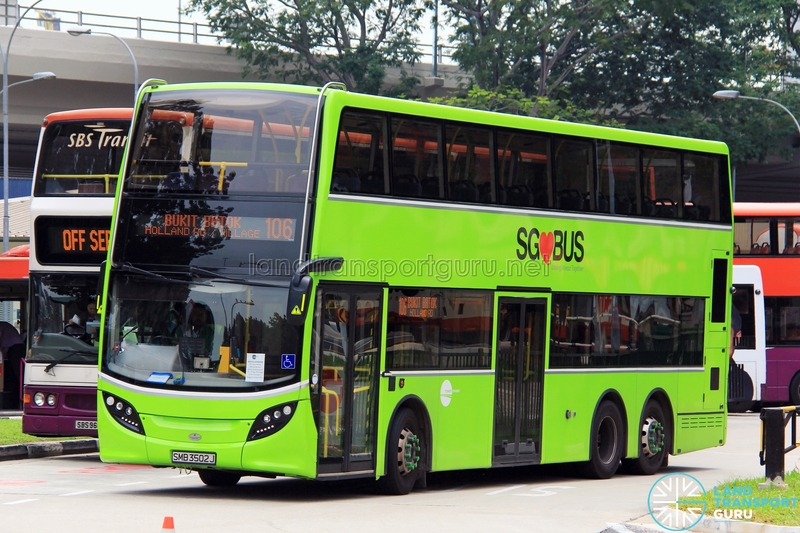 An Alexander Dennis Enviro500 Mock-up Bus, decorated in Lush Green, made its debut appearance at the Land Transport Authority (LTA)’s Our Bus Journey Carnival at Ngee Ann City. The bus is one of two concept buses commissioned by LTA to provide the public with a glimpse of how buses would look like in the future, the other being a MAN Lion’s City DD L.
The concept bus features three doors and two staircases, with new features such as seats with headrests, USB charging ports, and stylish interior mood lighting. 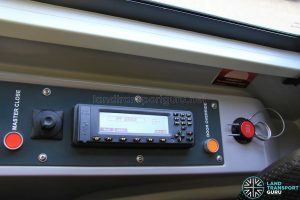 In 2018, the bus underwent air-conditioning upgrading work for permanent display. Apart from building chassis in Guildford, England, Alexander Dennis Limited manufactures its chassis in Johor Bahru, Malaysia through a partnership with Terberg Tractors Malaysia Sdn Bhd (TTM) (formerly Sime Darby TMA Sdn Bhd), a subsidiary of Sime Darby Industrial. It supplies the Asia-Pacific region with various types of ADL chassis, most of which are shipped to its main assembly plant in Zhuhai, China. Its manufacturing plant, Terberg Manufacturing & Assembly Sdn Bhd, is located in the Pasir Gudang industrial estate, roughly 20 kilometres east of the Johor Bahru city centre. 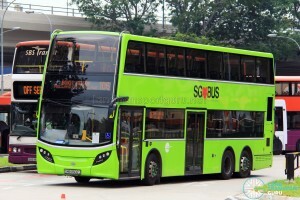 Except for SBS5001A, all Enviro500 buses in Singapore are assembled in Zhuhai City (Guangdong Province, China) by Zhuhai Granton Bus And Coach Co., Ltd. (珠海市廣通汽車有限公司) [Link]. 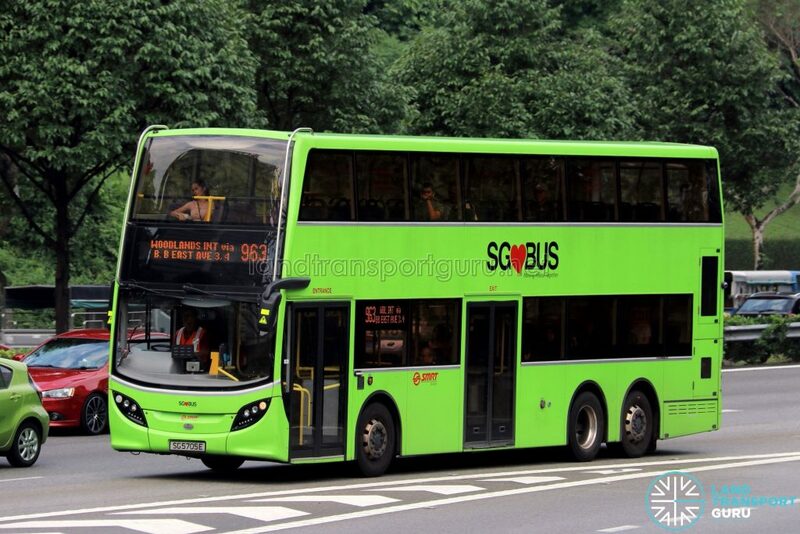 The company has been assembling Dennis buses for Kowloon Motor Bus since 2005, and has officially been in partnership with Alexander Dennis Ltd since 2011, supplying the region with Dennis buses. Excluding a small handful of UK-built units, Enviro500 MMCs for the Hong Kong market are assembled by Zhuhai Granton. 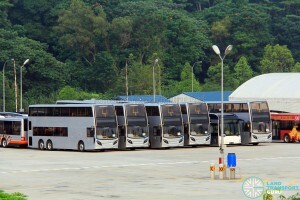 Due to the complexity of the SMRT livery, buses from Zhuhai (with the exception of the first few units) were delivered solely with the silver base coat. 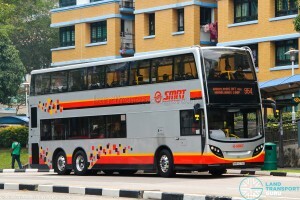 The additional red, black and yellow decals were fixed in Singapore by SMRT Buses and/or other companies as tendered out by SMRT. The complexity of the livery (given the ‘pixel’ design) added to the complexity of the painting process. New Dennis Enviro500 MMCs at Woodlands Bus Park, along with several other Batch 3 MAN NL323Fs. Note the temporary side view mirrors attached to the two far-most buses, which will later be replaced. The Enviro500 is part of the Enviro series of Dennis low-floor buses which was launched in 2002. The original Enviro500 was produced by Dennis (then known as TransBus International) modified from a Dennis Trident 3 (hence the original name Trident E500). In late 2003, a face-lifted version was offered; the second-generation Enviro500 (or Enviro500 MkII), featuring both modified chassis and bodywork. The Enviro bodywork was also compatible with the Volvo B9TL chassis, and Kowloon Motor Bus of Hong Kong acquired over 80 such vehicles. From May 2004, when Transbus International was reorganized into Alexander Dennis Limited, or ADL (while absorbing Walter Alexander Coachbuilders and Dennis Specialist Vehicles), future Enviro500s would be marketed under ADL. Originally offered with the Euro III Cummins ISMe335 (also from the Trident 3), the more environmentally-friendly Cummins ISLe340 option was available in Euro IV and Euro V ratings, relying on Selective Catalytic Reduction (SCR) technology to reduce emissions. Voith or ZF transmissions with SensoTop or TopoDyn fuel-saving features are offered for the Euro V rating. A hybrid electric version (Enviro500H) is also offered, using GM-Allison’s parallel hybrid drive system. 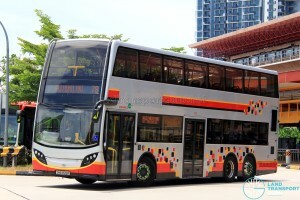 In 2012, Alexander Dennis revealed the third-generation Enviro500 aimed at the Hong Kong market. Named the Enviro500 MMC (for Major Model Change), it boasts a new exterior styling adapted from the Enviro400, along with an all-new interior. The new chassis features improved maintainability, reliability and reduced operating costs. New design features included offsetting the longitudinally-mounted engine and gearbox, along with a safer straight staircase and fuel tank underneath the stairs, a design feature adapted from the Enviro400. The chassis was offered in 11.3m, 12.0m and 12.8m lengths. A rear-axle steering system is also made available, supplied by ZF (Servocom® RAS).